We left for Safeco field at about 9:20 this morning. 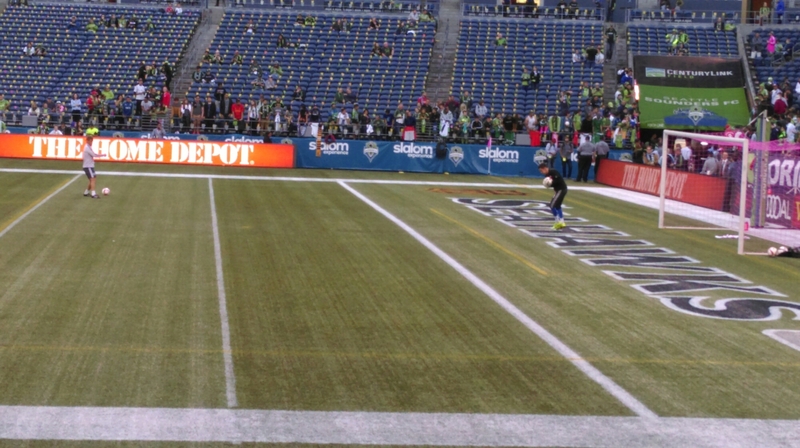 We should leave Century Link field at about 9:00 PM. A long day, but so far so good. Mariners won their last game 3-2, over the Athletics. We did a fair amount of scoreboard watching during the game. Before the game we wandered and said so long to seat hosts, alcohol enforcement, coaches and a few players. Carl got four more baseballs, for a season total of 197. Just a few shy of a milestone. And ichiro pitched an inning for Miami. Makes me wonder whether he is ready to retire. A few years ago Ashlan went to six Mariner and one Sounder game. All were wins, and one was Felix Hernandez’s perfect game. This week I have been to six Mariner games and am awaiting the Sounders. My record is 2-4, so far. I guess I don’t have the touch. Again the weather has been remarkably nice for October. And I have been able to spend time with Carl and friends. Go Sounders. And don’t let 6 AM come too early tomorrow morning. This entry was posted on October 4, 2015 at 5:40 pm and is filed under Uncategorized. You can follow any responses to this entry through the RSS 2.0 feed. You can skip to the end and leave a response. Pinging is currently not allowed.